Cats are natural tree climbers. They are very good at climbing up, and once they get up high, they are very mobile walking along the branches. Heights don't scare them, and they walk freely with excellent balance and fluid agility around, under or over this limb or that twig. Being light and agile, they can go to parts of the tree that a person can't, even with all his ropes and gear. So it is to be expected that sometimes a cat can get stuck in a part of the tree that no tree climber can reach. I have often worried about being called to rescue a cat that I cannot reach, but, so far, that has not happened. Nevertheless, it is a haunting and torturous feeling that is always there in the back of my mind. 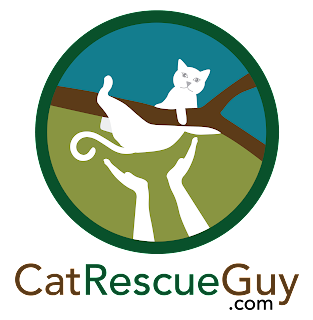 When I got the call from Donna on this Sunday to rescue an unknown cat, I had my usual concerns about not knowing anything about the cat, but I was not concerned about being able to reach it. Overall, I was expecting a routine rescue case except for one thing: this would be my 100th rescue. 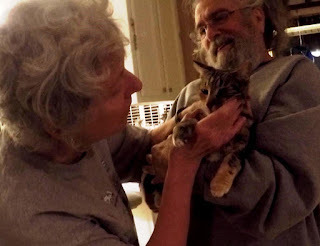 Donna told me that she had been hearing the cat for a while, but it took a long time before she found it in a tree in her next door neighbor's back yard. She posted a plea for help on Facebook where someone referred her to me. By that time, however, she stopped hearing the cat and did not see it anymore, so she just assumed it found a way down on its own. The next day she heard and saw it again, and that is when she called me. By this time the cat had been in the tree at least three nights as far as anyone knew. Donna and her next door neighbor, Lawrence, were friends, and he had no problem with allowing me to come into his yard to rescue the cat. When I arrived, I could hear the cat crying, but I had a very difficult time seeing it even with Donna's directions and finger-pointing. When I did see it, my concerns about an unknown cat began to dissipate, since it cried while looking at us and tried to come down toward us. This was not a feral cat, and since its ear was not tipped, it was not even a community cat. This was a tame cat, so there was at least a good chance that it would be friendly and cooperative. While I was feeling better about the cat, my concerns about the tree were growing as large as the tree itself. 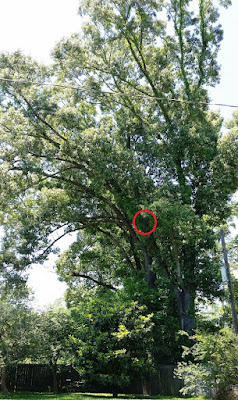 It was a 100' tall oak of some variety, and it was very large. This picture of the tree was taken from behind in a neighbor's yard around the corner. The trunk was about six feet in diameter and rose to a height of 20 feet before the first branch. At that point, the trunk split into stems, one of which arched upwardly and outwardly a length of 75 feet over the servitude and over the yard and house of the residence behind. The cat was about 15 feet up this stem resting on one of several burls that I saw throughout the tree. The stem was large and sloping gently enough that the cat could walk both up and down with relative ease. If the cat would not let me get close to him, he had a lot of room on that stem to get away from me, and I would not be able to follow him. A tree this large should have several good places to set my rope, but if they were there, I could not see them because the dense foliage blocked my view. I saw only two places to use, one a bit too low at 20 feet and the other at 70 feet. The one at 20 feet would allow me to get my head up to the level of the beginning of the cat's stem, but I was not sure I could get myself high enough to stand up on it. This would be adequate if the cat was cooperative and came to me, but otherwise, I would be wishing I had set my line at the 70 foot point so that I could go farther up the stem to get closer to the cat. I had a lot of difficulty setting my rope in the 70 foot crotch. I tried seven times to get my line up there, but either I kept missing the mark, or I could not get the rope to go over the obstacles. In frustration, I gave up and decided to use the 20 foot branch and hope the cat was cooperative. Even on this relatively easy, low point, it took me three tries before I got my line set there properly. I climbed up the rope still not sure how I was going to get myself up on that stem. Once I reached the stem, however, I saw some places I could use to pull myself up a little higher. After much effort and sweat, I stood on the stem and looked up for the cat. It had been watching me all this time and remained quiet on its burl perch about 15 feet above me. All I could see was its head peering over the burl at me. I saw tortie colors on its head, but I saw a little white under its chin. I thought it was probably a girl. I was a little disappointed in her reaction to me. After giving her some time and some sweet talk, I was hoping she would be happy to see me and start moving toward me. She didn't. She was not impressed by what she saw at all, but she wasn't afraid either. It was time to open a can of fishy food to see if that would gain her interest. She seemed mildly interested in the food at first but made no advances toward it. I put the food on the end of a long pole and held it closer to her. For this, she had a reaction. At first, I thought she was getting excited to see the food, but I was wrong. For unknown reasons, she found it a bit too scary and turned around and walked up and out the stem. I could not see where she went. Even with the help of the people on the ground, I could not find her, but it was clear that she was a long way away. I began to pull myself up the stem to attempt to follow her, but it quickly became clear that I would not be able to go very far. The cat was out of my reach, I was tired, and it was getting late. This routine rescue had turned into the dreaded cat-out-of-reach defeat. I didn't know what to do. I don't like to give up, but it was becoming clear to me that I needed to come up with a very different plan if I was going to rescue that cat. I would have to go home and think about it and, hopefully, have a new plan for tomorrow. In the meantime, it occurred to me that I had nothing to lose by setting a cat trap there in the tree and hoping for the best, but I did not see any decent places to set the trap. The trap needed to be somewhat level, and the entrance needed to be within reach of the cat as it came down the stem. I saw only one place that might work, so I decided to give it a chance. I went down to the ground, got my trap and climbed back up the tree. I force-fit the trap in place and used three lashing straps to secure it to the tree, making sure it could not be moved in any direction. The approach to the entrance would be a little awkward for the cat, but cats are agile, and very hungry cats are highly motivated. After making sure all was set properly, I went down again. I left my rope there in the tree so that I could go back the next day and climb the tree without having to re-install it. I packed up and left. I felt bad. Being so tired just made me feel even more like a failure. I could not rescue this cat. This was it -- the dreaded case of a cat I could not reach. And for this to happen on my 100th "rescue" just added insult to injury. What's worse, the cat was stuck and suffering at least one more night in the tree. It would eventually get too tired and fall out of the tree, but in a tree this size, it is also possible it would not fall out. I had been defeated. I was not good enough for this challenge. I went home and drank a lot of water to get re-hydrated and ate some food to get re-energized. Then I took care of my cats and fed them. While I was feeding them, my phone rang. It was Lawrence. The cat was in the trap! I caught him! I was super thrilled! I made my cats eat fast so I could get back over there to retrieve the cat out of the tree. It would be dark, but my rope was already installed, and this would not take long. I did not want to leave the cat up there another night. Lawrence and his son graciously helped me bring my gear to the backyard and held lights for me to see. I went up the tree and got my first good look at the cat. It was not happy with my arrival there, but I went to work quickly to secure the trap to a rope and lower it to the ground. I came down, packed up and then took the cat over to Donna who had earlier agreed to keep it for the short term. Donna is an artist and has an art studio where she had planned to keep the cat. She already had food, water and a litter box set up for it. I took it inside and gave it a minute to settle down. I released it, and, as expected, it looked for a place to hide. It needed some time to watch and explore this new, strange territory and feel safe, so I just waited patiently for it to do so. As it moved around the small room, I could finally see the unusual markings. This was not a tortie or calico or tabby. 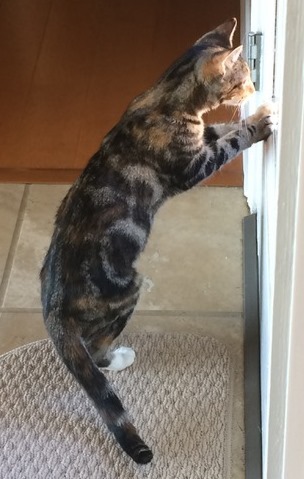 This was a torby, a mix of tortie and tabby, but with circular markings on both sides and probably a female. It took a few minutes before she felt safe enough to approach me. I reached out my hand, and she stopped to sniff it. Then she allowed me to touch her and then to pet her. She enjoyed the touch and relaxed enough to eat some of the food there. Now that I could touch her, I held my microchip scanner over her, and, to my utter surprise, it found one right away. This cat has a microchip! That is the best news I could have imagined. I didn't have anything with me to record the number, so I called to Donna just outside the door to write it down. She typed it in a text message and sent it to my phone which I had left in my truck. Now, for the fun part. I went to my truck to get my phone to contact the microchip company. After impatiently waiting on hold for a few minutes, I gave the chip number to the operator and waited for her to look it up. She told me that the cat's name is Bella, and there was one phone number for the cat on file. She put me on hold while she called the owner. When she came back to me, she connected me to Kathleen, the cat owner. 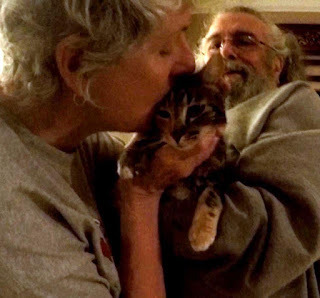 Kathleen was so excited to learn about her missing cat, that her voice trembled as she tried to figure out what to say while processing this surprising news. I told her the story about how I rescued Bella out of a tree thanks to the concern and generosity of Donna and Lawrence. As it turned out, Kathleen lived on the same street less than a block away. I told her I would be there in a few minutes with her Bella. I walked back to the art studio with a carrier to get Bella. I set the carrier on the floor and opened the door. I didn't have to pick her up and put her inside. She voluntarily walked directly inside on her own. That was easy. When I arrived, Kathleen was waiting for me in the driveway with her joy and emotion very evident on her face. She led me inside where I set Bella on the floor, still in the carrier. Bella had a cat brother there who had also been missing her. He walked up to the carrier to sniff Bella through the door. They both recognized each other, so I felt it was safe to release her. Bella walked around getting reacquainted with her home and brother while Kathleen and her husband, Leslie, watched with joy and wonder. They were still having trouble comprehending the return of their beloved cat. Kathleen picked up Bella, held her in her arms and gave her several kisses on her head. Gradually, I learned more about Bella's story. They had adopted Bella from Cat Haven just a few months earlier. Bella is estimated to be a little over a year old now. Kathleen and Leslie recently went on a trip to Hong Kong and left their trusted cat sitter in charge of the cats in their home. The cats have a cat door to the outside which they are allowed to use freely because they enjoy the small fenced-in back yard. When the cat sitter arrived to care for the cats one day, Bella was no where to be found. The sitter did everything humanly possible to find her, but was unsuccessful. She relayed the news to Kathleen and Leslie, and they were sick about it. At the end of their trip, their return home, normally a happy occasion, was instead a dreaded time because Bella would not be there. Bella had been missing for a total of 19 days, almost three weeks. 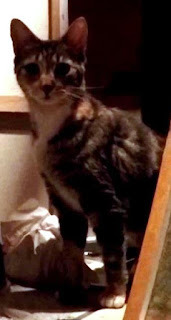 If she had not been stuck in the tree, or if Donna had not been as concerned and conscientious, or if Bella had not been micro-chipped, it could have been much longer, or there may have been no reunion at all. I enjoyed visiting with Kathleen and Leslie, and they were very grateful to me and the neighbors who made this happy reunion possible. I started this rescue at 2:30 in the afternoon, and by the time I got home, it was 10:00 at night. My earlier feeling of defeat and despair had turned into elation. I was still dog-tired, but elated. My rescue failure had turned into one of my most joyful and memorable successes. What a way to celebrate 100 rescues. For various reasons, I have no video of the rescue. Since I could barely see Bella myself, the video would not have been useful anyway. While I had the camera with me and running for Bella's reunion with Kathleen and Leslie, my otherwise trusty camera disappointed me with a very poor exposure making the video mostly useless. The only two good pictures I have of Bella here come from Kathleen who graciously shared them with me. Thank you, Kathleen.